100% wild-caught fillets breaded in a crunchy, golden panko coating. When something tastes this good there’s no room for anything artificial. 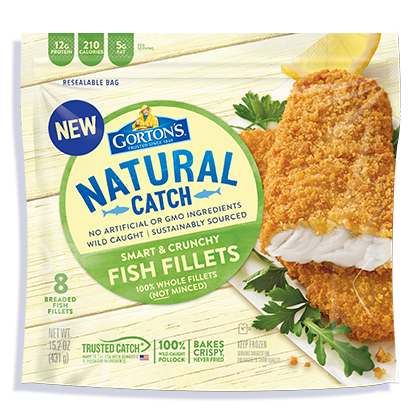 Our Smart & Crunchy Fish Fillets are 100% sustainably wild-caught and breaded in a crunchy, golden panko coating. They’re always baked—never fried— for a crunchy and delicious fish you can feel great about enjoying. 4. Bake 23 - 25 minutes total*. Flip after 16 minutes. *FULLY COOK FISH TO AN INTERNAL TEMPERATURE OF 165˚F OR HIGHER BEFORE SERVING. INGREDIENTS: Pollock fillets, breadcrumb coating. Wheat flour, water, whole wheat flour, palm oil, yellow corn flour, whey, natural flavor, sea salt, sugar garlic powder, onion powder, salt, yeast, xanthan gum, acacia gum.